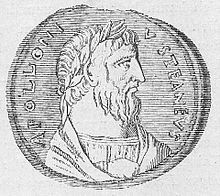 Apollonius of Tyana (c. 15 – c. 100 CE) was a Greek Neopythagorean philosopher from the town of Tyana in the Roman province of Cappadocia in Asia Minor. If someone gives money to Apollonius, and the giver is someone considered respectable, he will take the money if he needs it. But he will not accept a fee for philosophy even if he does need it. To speak falsely is the mark of a slave, but the truth is noble. Approve and pursue the kind that is in accordance with nature. But avoid the kind that claims to be inspired: people like that about tell lies about Gods, and urge us to do many foolish things. I saw the Indian Brahmans living on the earth and not on it, walled without walls, and with no possessions except the whole world. [Some] disobey the earth and sharpen knives against the animals to gain clothing and food. The Indian Brahmans disapproved of this personally and taught the Naked Philosophers of Egypt to disapprove of it too. From there Pythagoras, who was the first Greek to associate with Egyptians, borrowed the principle. He let the earth keep living creatures, but held that what the earth grows is pure, and so lived off that because it was sufficient to feed body and soul. Clothing made from dead creatures, which most people wear, he considered impure; he dressed in linen and, for the same reason, made his shoes of plaited bark. He derived many advantages from this purity, above all that of perceiving his own soul. The natural philosopher Heraclitus said that man is naturally irrational. If this is true, as it is true, then everyone who enjoys futile glory should hide his face. You must shun barbarians and not govern them since, barbarians as they are, it is not right that they should receive a benefit. In my judgment excellence and wealth are direct opposites. Greet your son Aristocleides from me. I pray he may not turn out like you, since you, too, were once an irreproachable young man. The soul that does not consider the question of the body’s self-sufficiency cannot make itself self-sufficient. When He went out of incarnation at the Crucifixion, Jesus was a fourth-degree initiate, and became a Master of the fifth degree as Apollonius. Now Euxenus realized that he was attached to a lofty ideal, and asked him at what point he would begin it. Apollonius answered: "At the point at which physicians begin, for they, by purging the bowels of their patients prevent some from being ill at all, and heal others." And having said this he declined to live upon a flesh diet, on the ground that it was unclean, and also that it made the mind gross; so he partook only of dried fruits and vegetables, for he said that all the fruits of the earth are clean. And of wine he said that it was a clean drink because it is yielded to men by so well-domesticated a plant as the vine; but he declared that it endangered the mental balance and system and darkened, as with mud, the ether which is in the soul. After then having thus purged his interior, he took to walking without shoes by way of adornment and clad himself in linen raiment, declining to wear any animal product. Philostratus, Life of Apollonius, translation by F.C. Conybeare, Book 1, § 8. Full text online at Livius.org. This page was last edited on 25 January 2019, at 19:42.